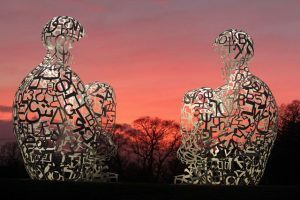 In this stunning piece of sculpture by Spanish artist Jaume Plensa at the Yorkshire Sculpture Park we are invited to rediscover the art of wonder. To pause, be still, observe and allow life and nature to be present to our deepest selves, and to be open to the invitation of Christ to be one with him and his creation. One of my favourite bible passages is from Romans 8:19 that says all creation is on tiptoe as it eagerly awaits the sons of God to come into their own. 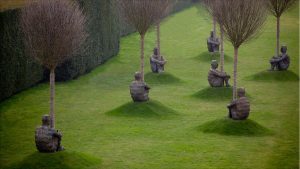 Plensa combines the beauty of text and poetry within monumental human forms that are sited in public spaces all across the world. For him art is a conversation with the viewer, the environment and the spiritual realm. He doesn’t distance us from his work with barriers or rules, but invites us to gently caress and participate in the conversation. He engages our senses through light, sound, water, video and tactile exploration, opening possibilities for new perspectives both internally and externally, an invitation to wonder. The desert fathers, the Christian mystics of the early church and many characters in the bible value and practice the discipline of wonder. To wonder is to stand in disbelief, to be present to the questioning, and to stand in awe before something that is greater than your own understanding. Are we perhaps losing the art of wondering in our culture of cerebral knowing? Do we give space for questions, for pondering, for amazement? Have we given up on the notion of mystery and instead believe that we have the knowledge to gain the answers to everything? Mystery is perhaps only ignorance. Knowledge finite rather than infinite. And yet over the past few years scientists are uncovering more and more of the complexity of life and cosmos, and it is causing them to wonder and be amazed at the beauty, the rhythm and the pattern of the universe and the life it sustains. The idea of wonder, of ‘questio’, of seeking, was at the heart of the early church. Curiosity was encouraged in order that you keep your body, mind and spirit open to all that God has and is, rather than just limiting him to things already understood and defined by man. Their understanding of God was that he was so much greater than their thinking and experience, that they could never define him and therefore they enjoyed discovering more of mystery, of wonder and of finding God everywhere, everyday, in each moment. This desire for wonder has taken the form of a search for ‘spirituality’ and ‘mindfulness’ in our contemporary culture. Many have become disillusioned with the western minds move from wondering to answering. Recognizing the limitations of dualistic thinking and the fundamentalism and violence it has often caused across the world, we now long for unity, for harmony, for integration, for the mystery that the story and history of Christianity is based upon. And yet too often the christian church has adopted the modern western mindset and defined itself by ‘answers’, by debates and defending positions it believes to be unshakeable truths about who is included or excluded from the kingdom of heaven. Is it no wonder that our numbers are falling, for the consciousness of the 21st century is disillusioned with the limited message and exclusive rules that the church has been shouting about for the last few centuries. It is disillusioned by the violence and fear caused by fundamentalists in all the monotheistic religions defending their interpretation of truth and holiness. People largely long to recover the spirit of wonder and mystery, of beauty and harmony, of love and forgiveness. For many, our unconscious mind feels uncomfortable with the growing divide between rich and poor, black and white, male and female, Christian and Muslim. We recognize God at work in a society that is trying to bring about unity and oneness, an equality across the body of humanity despite at times our attempts being rather aggressive and imposed. The intention is good, for at its heart this is the call of Christ, that we should be one, to consider no-one less than yourself and to love your brother and sister as you love yourself. If we are to truly grow in ‘oneness’ and for the body of Christ to include all of humanity then it is essential that we once again embrace the art of wonder and mystery. That we don’t provide instant answers but allow the questions to rise and be present within us and not to divide us. To be open to wonder is to embrace humility and to keep seeking, believing that our God is far greater than we can ever imagine or understand. 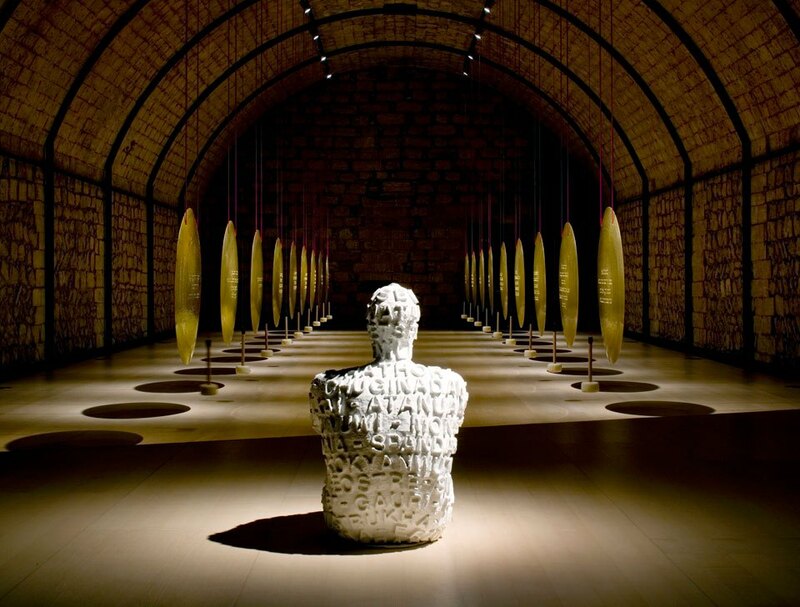 Many of Jaume Plensa’s sculptures are made of conjoined letters and words, inviting us to think, question and wonder. The words are not necessarily in any order so as to make sense in the form of a sentence but instead offer space to reflect on your own narrative; to complete the meaning of the work through your own personal reading and reflection rather than to have a specific discourse. The artist guides us and begins our journey of wonder and then leaves us to travel alone with our thoughts, to listen to the work and its setting rather like the words of a poem. Let’s relearn the discipline of wonder.